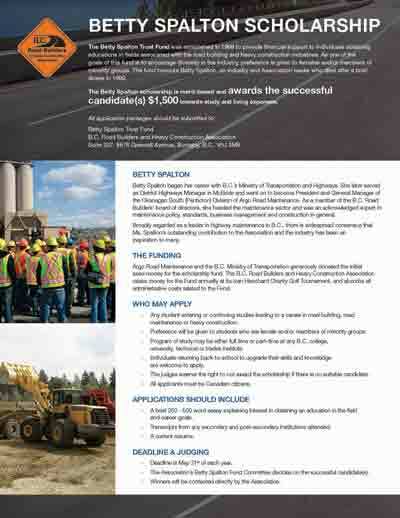 The BC Road Builders and Heavy Construction Association (BCRB) is accepting applications for our 2017 Betty Spalton Scholarships. The Betty Spalton Scholarship Fund was established by the BCRB in 1999 to provide financial support to individuals obtaining educations in fields associated with the road building and heavy construction industries. The fund honours Betty Spalton, an industry and association leader who died after a brief illness in 1999. Betty began her career with BC's Ministry of Transportation and Highways. She later served as District Highways Manager in McBride and went on to become President and General Manager of the Okanagan South (Penticton) Division of Argo Road Maintenance. As a member of the BC Road Builders’ board of directors, she headed the maintenance sector and was an acknowledged expert in maintenance policy, standards, business management and construction in general. The Association proudly awards up to two $1,500 scholarships each year in Betty’s honour to students pursuing careers in heavy civil construction such as heavy equipment operators/mechanics, paving laydown technicians, grades persons, project managers, engineers, etc. Congratulations to the 2016 winners: Jackson Gagnon, William Monforton and Gregory Page. Jackson worked the past three summers as a labourer with Terrace Paving and is attending UBC-Okanagan (UBCO) taking the first year civil engineering program. William is a junior project engineer and worked a few terms with Emil Anderson Construction. He is in his fourth year of the civil engineering program at UBCO with a focus in transportation engineering. Gregory started his first year of civil engineering at BCIT.